An expanded explanation into each part of the query building process to make sure you get the best results. Topic creation is part art and part science. We understand that it is nuanced and can be a little tricky at first. We're confident that with a little time and effort invested now, you can save a ton of both in the future. 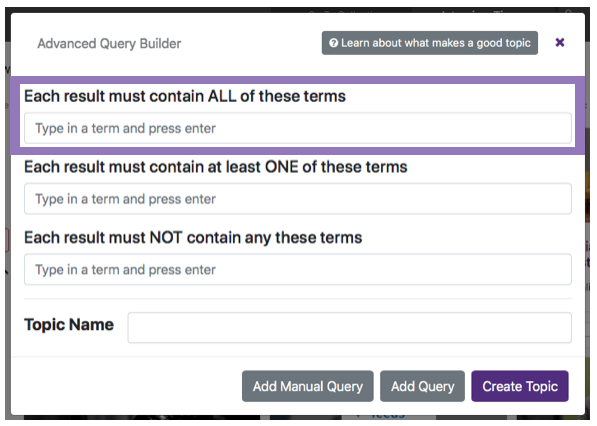 We created the Query Builder to make the process easier, though if you feel confident with boolean searches, you can create your own by clicking "Advanced" and making your own query. 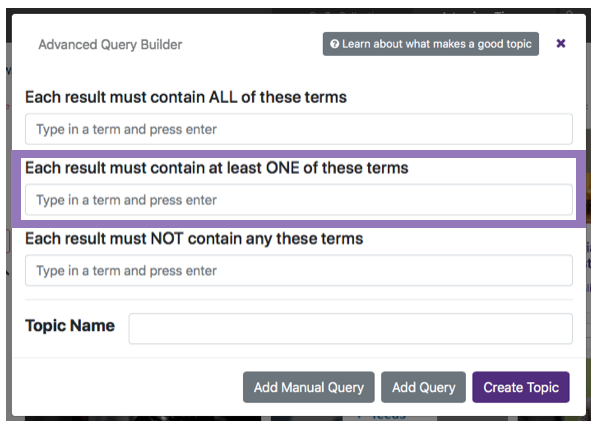 Read on to learn how to best utilize the Query Builder to find the content you are looking for. Any words or phrases entered here will tell UpContent to find only content that include all of these exact terms. Because of this, it is best to limit your terms in "ALL" to 1-3, to avoid narrowing your topic too far. It helps to enter the general, broad terms related to your search here, such as: Real Estate, Marketing, Finance, Cars, etc. Articles with all of the terms in "ONE of" will be scored higher and appear closer to the top of your results. For example, you might see an article about small business trends, an article about small business technology, or an article about small business tech trends. "ONE of" allows you to bring it all in. For most topics, one query line is enough to find the content you want. However, it can be useful to add queries to bring a different yet related set of results to your topic. For example, if you're interested in financial planning, you might want a query surrounding financial advice articles to share in a newsletter, but in the same topic, a query surrounding financial news (stock market, investments, legislation, etc) to add your voice to on social networks. 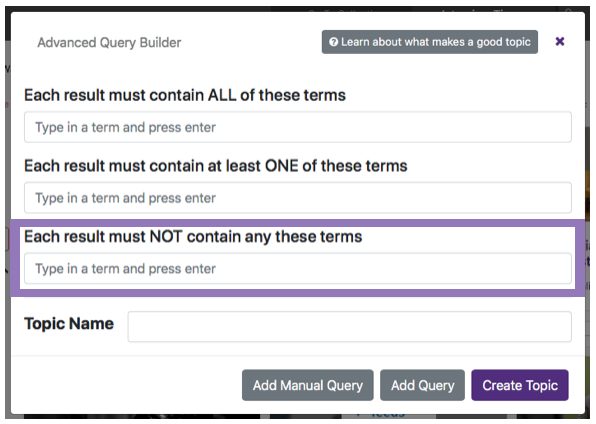 To add an additional query (you can add up to 10), click on "Add Query" and start using the Query Builder again. It is important to note that each additional query is independent of each other, the search criteria are not connected. Every new query will bring in a new set of suggestions to your topic. If you're confused about creating topics with UpContent, feel free to schedule a complimentary topic creation session and walk through it with us over the phone.